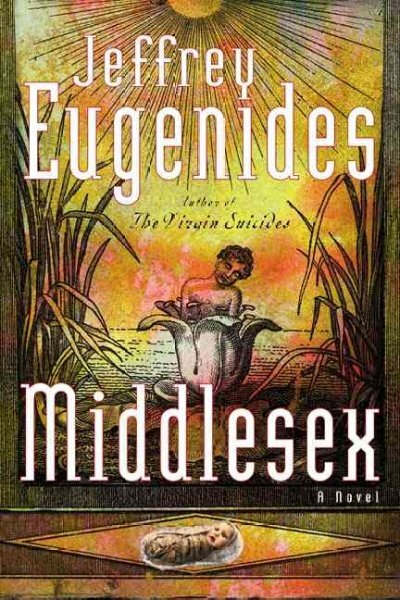 Middlesex, by Jeffrey Eugenides, Farrar, Straus and Giroux, 2002, 529 pp. Middlesex is just the kind of epic, multi-generational novel I love. It had rich characters who experience strange relationships and personal transformation. It offered a window into other communities and cultures outside my experience. And it told a compelling story about fascinating characters I could imagine in real life. Middlesex is the story of a hermaphrodite, raised as a girl, who comes to discover “she” is genetically male. The novel traces the roots of this unique genetic code to the history of intermarriage from her grandparents’ small Greek village. The background of the story tells of the Turkish invasion of Greece, the immigrant Greek community in Michigan, the sexual revolution of the 1960s, and the evolving understanding of intersexuality. It is the story of a singular life, told across multiple generations. I found the book compelling from the opening pages, but it took me quite a few chapters to come to like the narrator. The book is told in first person by the adult Cal, who initially sounds callous and distant. It is always challenging as a reader to have a narrator you don’t like. It was Desdemona (Cal’s grandmother) that first won my heart, and then it was Calliope (Cal’s childhood name as a girl). By the middle of the book, however, Cal’s voice had one me over, and I had learned to like him as well. Middlesex is a beautiful novel, from beginning to end. I recommend it to anyone looking for a deeper exploration of the human mind, gender and the way biology and family conspire to give shape to identity. I look forward to reading more from Jeffrey Eugenides. Photo of tornado that hit Henryville, from crabbyhousewife.com. Exactly ten days ago, deadly tornadoes rolled through our region. Since noon that Friday, when my son’s school announced an early closing, every plan, task and to-do list has been tossed aside. Our town is just a few miles from Henryville, Indiana, which took a direct hit from an EF4 tornado. Our congregation has families that live in Henryville, Pekin, Borden and New Washington. One family has lost their entire home, another family has sustained major damage. Two of our church’s youth attend Henryville High School, and they have lost their school building and the accompanying social events that give shape to their lives. Almost everyone has suffered emotional and spiritual trauma, as they feared for their own lives and worried over friends and loved ones in the hours after the storm. 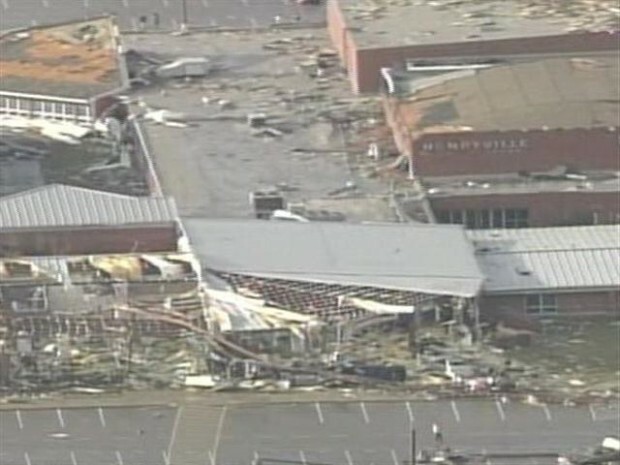 Henryville High School, devastated by the tornado. Last Sunday, less than 36 hours after the storm, our community gathered for the first time. For most of us, it was the first chance we had to talk about our experiences. I groped for something to say to my congregation in the wake of such devastation. In prayer, I realized we needed to do three things in that hour of worship: to acknowledge our feelings, to find our hope in God, and to organize our service. We began the sermon by simply inviting people to share words that described what they had been feeling. Scared. Fear. Anger. Sadness. Helplessness. Anxiety. Grief. Questioning. Gratitude. Relief. Questioning “why?”. While one occasion of worship was not enough to process all these feelings, there was a palpable sense of connection in the room as we realized that we were all feeling the same way. We could acknowledge that we were not alone in our struggles, and giving voice to our shared experiences gave us encouragement. The scripture that I had originally planned for that day was from the Lenten lectionary, Jesus’ admonition to “take up your cross and follow me.” I had planned to talk about Jesus’ confrontation with the evils of empire, and in my weekly video I had even asked people to ponder the question, “What would you be willing to die for?” After the storms, we all knew in a deeper way that we were not willing to die for our stuff. But many of our community also knew in a way that they never understood before how much they were willing to risk their own lives to protect family, friends and neighbors. People may try to tell you that suffering is good for you, or that God sent these terrible tornadoes as a cross for us to bear, that this is some kind of a test or blessing or way of making our faith stronger, but I’ll tell you right now—that’s just bad theology. I don’t believe it for a second, and neither should you. God doesn’t work like that—choosing to preserve a woodpile or a mailbox while destroying a home, saving one family when their neighbors across the street lose everything. God doesn’t use the winds to rip apart homes and lives and frighten us into submission. God doesn’t pick husbands over wives, grandparents over grandchildren, cats over dogs, non-Christians over Christians. God doesn’t send little children flying through the air to teach us a lesson. Any God who could be so cruel and fickle is not worthy of our worship. The God of Jesus Christ is the God of the cross, the one who is willing to suffer and even die right alongside us, so that we know that we are never alone in our most painful moments. The God of Jesus Christ and our God is the one who refuses to flee in the face of the storm, who huddles under mattresses and climbs into bathtubs, holding us tight in our most terrifying moments. The God of Jesus Christ and our God is the one who hears our most fervent and frightened prayers and whispers calm and peace into our ears. The God of Jesus Christ and our God is the one who searches every house and every ruin until the lost are found. The God of Jesus Christ and our God picks up a hammer, a bucket, and work gloves and starts cleaning up and rebuilding—and sticks around until every last family, every last person is restored to wholeness again. The God of Jesus Christ and our God uses Facebook and phone calls, e-mail and text messages to rally the family of Christians across the country to pray for this church and our two afflicted families by name this Sunday morning. The God of Jesus Christ and our God sends the resources of the One Great Hour of Sharing and UCC Disaster Response Ministries to our aid, and extends offers of support and supplies from every corner as we help our community start again. The God of Jesus Christ and our God does not delight in how much we suffer, but in our willingness, like God’s own Son, to go to the places of suffering in this world to shine the light, and hope, and love for all people. So that’s what we are to do: we who follow God, we take up our cross by following God into these places of suffering and grief, so that our friends and neighbors are not alone and they know God’s love is with them even in these terrible circumstances. For us as Christians, we don’t merely take care of our own—we will reach out to all those in need. This storm will be an even more devastating loss on those who were already living on the edge, and they will need our compassion and aid. We aren’t just acting from heart-felt compassion. We are people of faith, and service is a discipline for us, not just something we do because it makes us feel good. That means we’re making a long-term commitment, until every last person is restored to wholeness. That process will take many months, after the fear and the emotion and the passion have died down. The work will get tedious and much patience will be required—but you and I, this church, we have an opportunity in this moment to be for our community the light and the hope of God, and I know we will. I know we will. That felt like such a statement of faith that morning, but I knew it to be true—that our congregation would rally and work and give and serve in ways far beyond our imagined capacity. And we have, already. So much has changed in ten short days. Sabbatical seems like such a long time ago. My calendar has been filled with shifts at the Volunteer Center, clean-up days with church work groups, and pastoral care for our church families who are most affected. My e-mail inbox and Facebook news feed are full of storm-related communications coordinating needs and responses, including inquiries from church groups about summer mission trips. I find myself a part of a coalition for long-term recovery, and I anticipate dedicating many hours in the months ahead to organizing spiritual care for those who have suffered so much trauma. And yet, so much remains the same. For our congregation, this response to disaster is no different than what we do every day. When someone dies, when accidents happen, when lives fall apart, we are there for each other and provide for one another. When people in our community are hungry or homeless or lost, we provide food and shelter and care. When trauma and spiritual crisis arise, we offer space for seekers, room for questions, and reassurances of God’s grace and love. The intensity and the need have multiplied around us, but we have been committed to these faith practices for a long time already. We will sustain and increase that effort in the days, months and even years to come, as our community recovers, because we know God is with us, beckoning us into the suffering places to be light, and hope, and love.